One dominant theme of President Xi Jinping’s political report at the 19th Party Congress is China’s national rejuvenation. China was described as a “great power” or a “strong power” 26 times in his speech. According to Xi, by the middle of this century China will become a leading nation in comprehensive national power and international status. 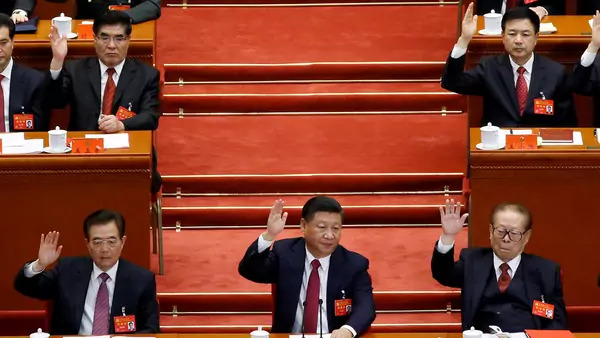 This will usher in a “New Era”: if Mao made China independent (zhan qi lai), and Deng made it prosperous (fu qi lai), Xi will make it strong again (qiang qi lai). Thrilled by this prospect, a top education official predicted that in 2049, Chinese standards of education will become the standards of the world. What is not emphasized in the report is that China’s path toward becoming a world leader is not likely to be smooth sailing. In order to fulfill these ambitious targets, China has to overcome four traps: the Middle-Income Trap, the Tacitus Trap, the Thucydides Trap, and the Kindleberger Trap. The Middle-Income Trap occurs when a country attains a certain income and gets stuck at that level, which falls short of that of advanced economies. Keenly aware of this challenge, Xi promised in 2015 that China’s annual growth would not fall below 6.5 percent for the subsequent five years. While he did not specify the growth rate at the 19th Party Congress, it is estimated that China’s GDP per capita has to reach more than $20,000 (in present value) and sustain an annual growth rate of at least 5 percent during 2020-2035 in order to “basically realize socialist modernization.” For this reason, GDP growth may continue to be used as the yardstick to measure local government officials’ performance. Meanwhile, in recognition of the social cost associated with the single-minded pursuit of economic growth, Beijing is taking a more proactive approach in promoting other developmental goals, including environmental protection and poverty alleviation. Sensing incoherence and contradiction in central policy, local officials may turn to strategic disobedience, timidity, or inaction in policy implementation, which can be exacerbated by the ongoing anti-corruption campaign. As a result, China may well find its economy end up like that of Mexico, Brazil, or Argentina, which show clear signs of the Middle-Income Trap. The Kindleberger Trap was coined by Harvard professor Joseph Nye but derived from the late economic historian Charles Kindleberger. Both the Thucydides Trap and the Kindleberger Trap highlight the danger inherent in the shifting balance of power. What makes them different is that rather than focus on the threats from a strong aspirant power (as implied by the Thucydides Trap), the Kindleberger Trap attributes the failure of the international system to the under-provision of global public goods. Kindleberger argued that the chaotic and disastrous nature of the 1930s was caused by the failure of the United States to assume the international responsibilities that came with the mantle of the largest global power that it took from Great Britain. The term can also be used to explain the challenges faced by the current global governance regime. As the United States seems to be retreating from its international commitment, the international community is turning to China, which has indicated its interest in filling the void left by the United States. Yet as I noted in a recent piece, China has to overcome significant capacity gaps–small amounts of foreign aid, a lack of soft power, and mounting domestic political economy challenges–before it can play the role of a true global leader. Of the four traps, the first two will determine China’s internal transition, while the other two will have direct implications for U.S.-China relations and global governance. The four traps are nevertheless not mutually exclusive. For example, both the middle-income and Tacitus traps undermine China’s ability to project its international power and influence, while the Thucydides Trap and the Kindleberger Trap both shape the international security and governance landscape that provides incentives or disincentives for China to address its domestic political and economic challenges. President Trump and his China team may have to keep the four traps in mind in their dealings with an increasingly confident and assertive China.